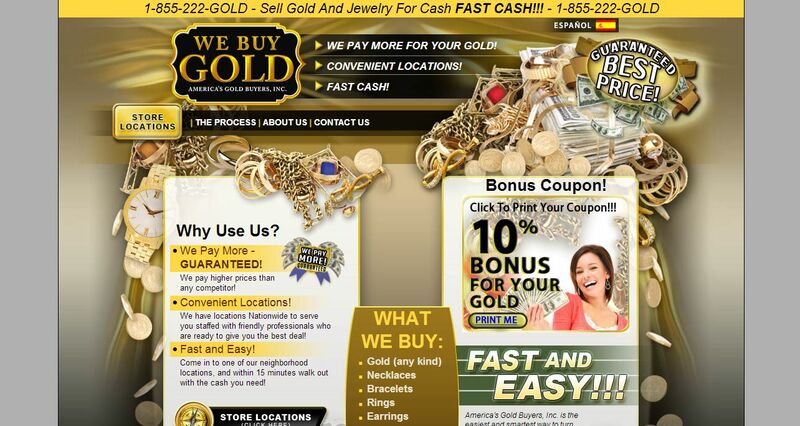 America’s Gold Buyers address, phone, website, and more. Want to sell gold jewelry for cash? America’s Gold Buyers, Inc is your neighborhood gold buyer that pays top dollar for your new, old, or unwanted gold jewelry. We guarantee to beat our competition by 110%. We’re committed to making you our next satisfied customer. America’s Gold Buyers, Inc offers fast and friendly customer service and the best prices for your gold. Sell your gold jewelry now by clicking on our Store Locator to find the contact details for the closest location to you. We can deliver the highest prices when you sell gold because we process gold in large volume! We cut down on costs by cutting out the middleman and keeping the entire process in-house. Our partner refines and purifies the gold we buy. All of which means our costs are lower than the competition’s and we can pass the savings on to you! With America’s Gold Buyers, Inc. you’ll receive top dollar for your gold’s true market value. For large volume customer’s payouts are even higher! Many gold buyers pay just pennies on the dollar for your gold, because they need to pay for their overhead. America’s Gold Buyers, Inc is different kind of Arizona gold buyer. Unlike other gold buyers, we keep everything in house, thus limiting our overhead and this allows us to pay you more. So now, even small amounts of gold can earn you top dollar! Please feel free to call one of our friendly gold representatives who can personally help you with your gold transaction. Come in to today! And let us make selling your gold quick, easy and profitable for you!